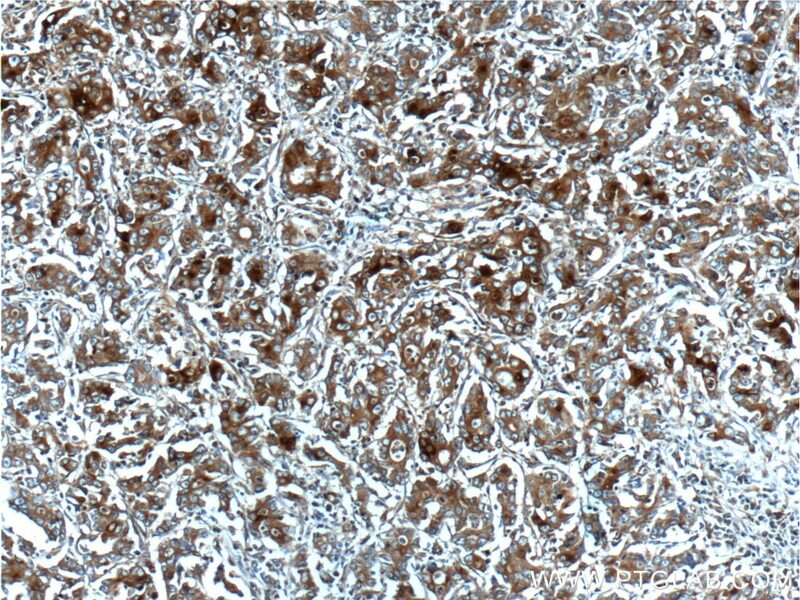 Immunohistochemical analysis of paraffin-embedded human stomach cancer tissue slide using 25715-1-AP( Osteopontin antibody at dilution of 1:200 (under 10x lens). 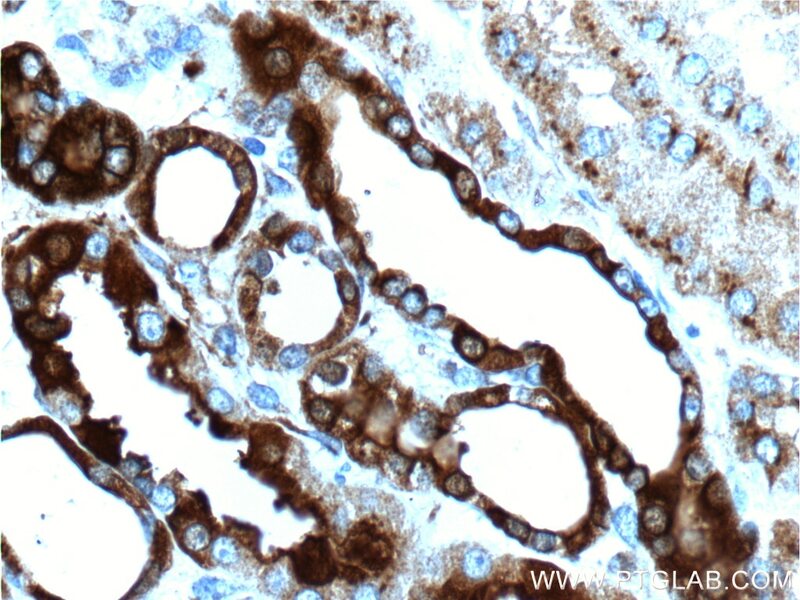 Immunohistochemical analysis of paraffin-embedded human stomach cancer tissue slide using 25715-1-AP( Osteopontin antibody at dilution of 1:200 (under 40x lens). Osteopontin (OPN), also known as SPP1, is a secreted glycophosphoprotein that belongs to the small integrin-binding ligand N-linked glycoprotein (SIBLING) family. Originally isolated from bone, OPN has been found in kidney, vascular tissues, biological fluids, and various tumor tissues (PMID: 15138464; 16406521). OPN can interact with CD44 and integrins and regulate diverse biological processes. It has a multifaceted role in bone development and remodeling, and is also involved in the inflammatory and immune response, oncogenesis and cancer progression. The very acidic nature of OPN, as well as the presence of variable posttranslational modifications, has led to anomalous migration in SDS-polyacrylamide gels and therefore to reports of different molecular weights for OPN (PMID: 8293561). Depending on the cell and tissue source and/or the SDS-PAGE system, OPN migrates with a molecular weight of 44-80 kDa, as well as at some smaller bands correspond to peptide fragments (PMID: 8195113; 17890765). Resveratrol Ameliorated Vascular Calcification by Regulating Sirt-1 and Nrf2. 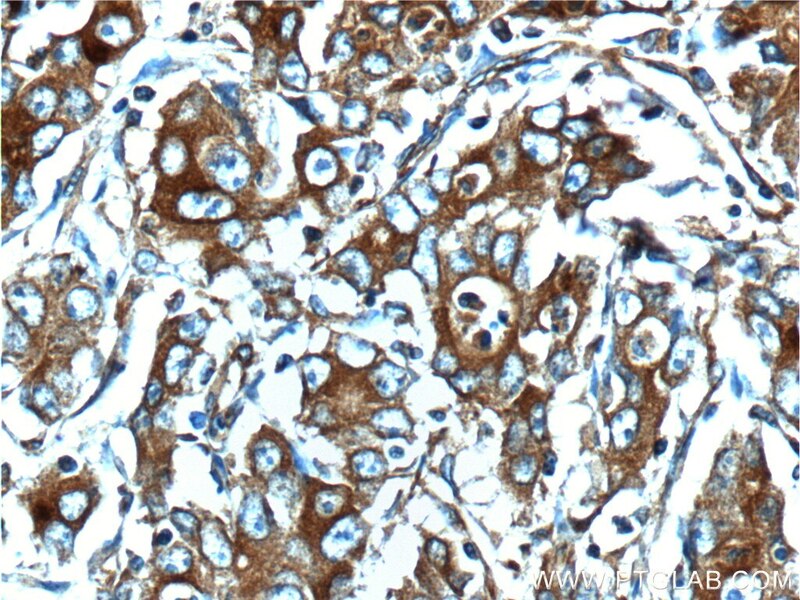 Immunohistochemical analysis of paraffin-embedded human kidney tissue slide using 25715-1-AP( Osteopontin antibody at dilution of 1:200 (under 10x lens). 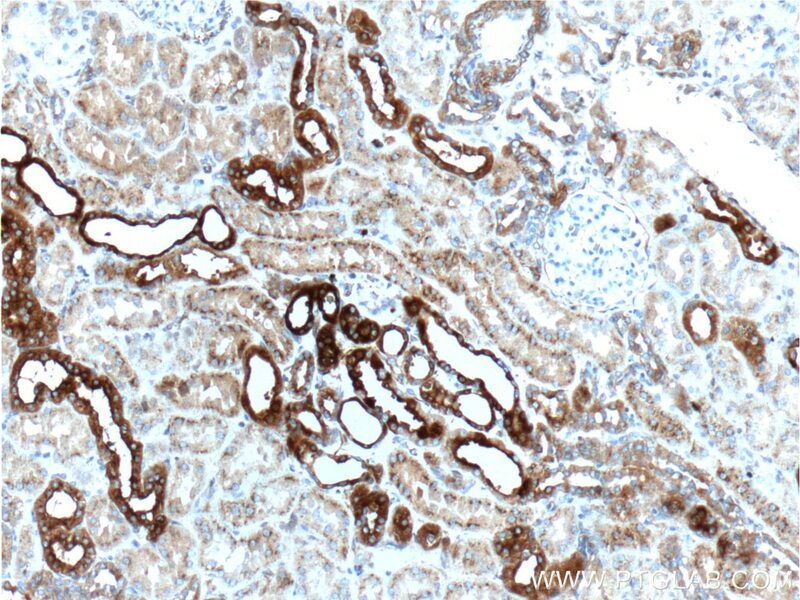 Immunohistochemical analysis of paraffin-embedded human kidney tissue slide using 25715-1-AP( Osteopontin antibody at dilution of 1:200 (under 40x lens). 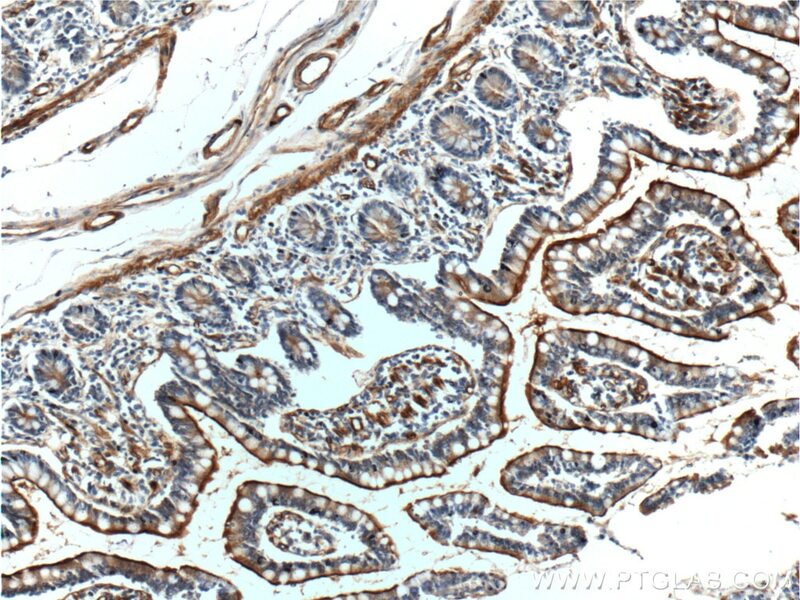 Immunohistochemical analysis of paraffin-embedded human small intestine tissue slide using 25715-1-AP( Osteopontin antibody at dilution of 1:200 (under 10x lens). 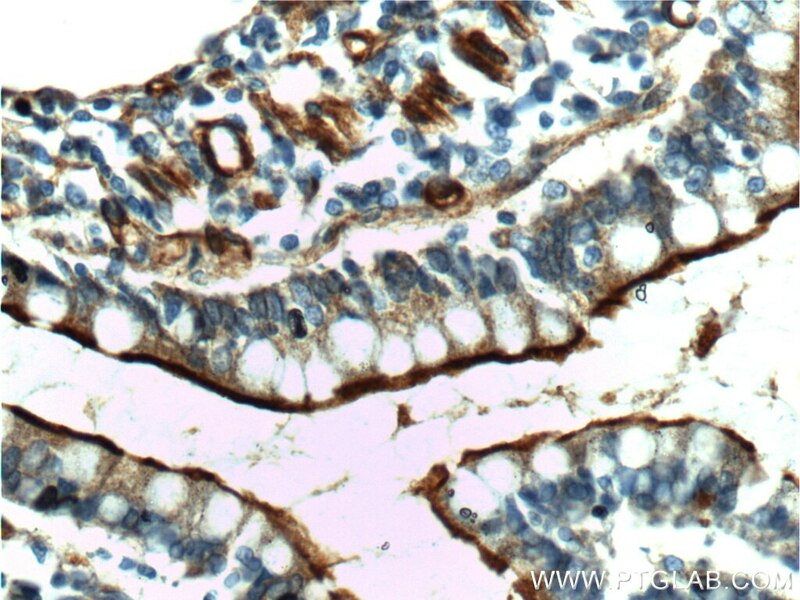 Immunohistochemical analysis of paraffin-embedded human small intestine tissue slide using 25715-1-AP( Osteopontin antibody at dilution of 1:200 (under 40x lens).